Apples, eggs and avocados helped make transport industry history Tuesday – the first commercial “last-mile” delivery made on public streets in a fully autonomous van. 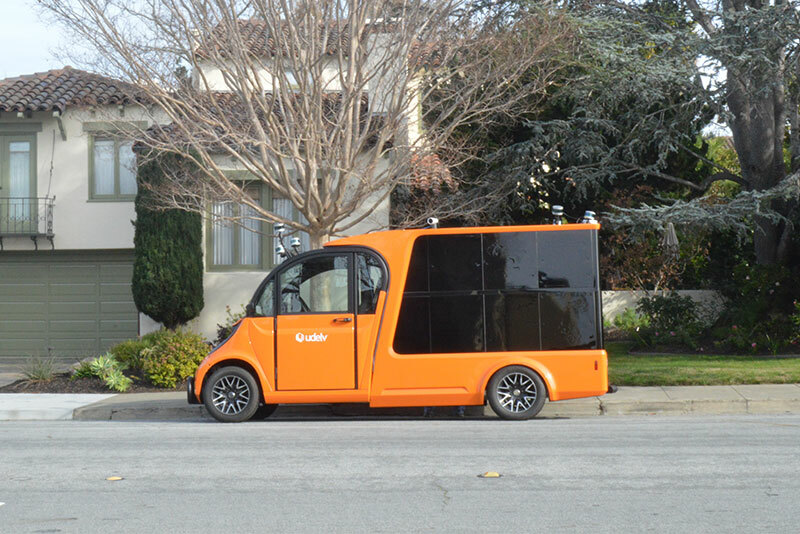 The delivery, in an orange and black electric vehicle built by autonomy startup Udelv, was made in San Mateo, an upscale Silicon Valley suburb of 110,000 just south of San Francisco. The custom-built package delivery van, bristling with rooftop cameras and Lidar sensors, made the roughly 3-mile run using public streets. It departed from Draeger’s Market, a local grocer and deli, made stops at the homes of two customers and returned without mishap 14 minutes later. “This is disruption of the highest order,” said Richard Draeger, co-owner of the family-run chain of four markets. He said the stores would start regular deliveries with the van this week. When fully operational and no longer in test mode, the Udelv system will increase customer convenience, improve the chain’s environmental footprint and slash delivery costs by as much as 50 percent, Draeger told Trucks.com. “The implications are profound,” he said. Tuesday’s demonstration was applauded by local politicians as well as delivery and autonomous vehicle industry representatives who viewed it via streaming media from a tent in the market’s parking lot. The loudest cheering came when Laury said the van could make deliveries at an operating cost of just 5 cents per mile. Several industry analysts contacted by Trucks.com after the event also said it was an impressive demonstration but cautioned that there still are many questions unanswered. The cost to the consumer wasn’t disclosed, and that’s a critical issue, said Michael Ramsey, an automated vehicles analyst with research firm Gartner Inc.
Customers ordering deliveries from Draeger’s using the Udelv system will see a benefit, Draeger said. Instead of having to wait for half a day or more to receive deliveries, the system’s goal is to give customers a window of 1 to 2 hours so they don’t have to waste time, he said. Additionally, the smartphone-based ordering system enables customers to redirect a delivery to a new address if necessary. Real deliveries with a single Udelv vehicle would serve customers of three of the chain’s stores that are clustered in adjacent cities, Draeger said. Both Draeger’s Market and Udelv would be learning over the next few months. Draeger’s “subscribes” to Udelv, Laury said. Its monthly payments buy the grocer an autonomous truck, proprietary ordering and logistics software and support in the form of a backup “tele-operations” service that monitors the truck remotely. It also provides a human “driver” to take control from a central console if the truck runs into problems its operating system can’t resolve. Until California law is changed to permit truly unmanned delivery vehicles to operate on public streets, Udelv also is supplying a safety driver for the van at no cost to Draeger’s, Laury said. The Udelv van was developed in conjunction with Los Angeles-based Motivo Engineering. Motivo designed and built the cargo compartment with its 18 separate bins and their electro-mechanically operated doors. Delivery Guys, a northern California logistics firm that works with customers ranging from Draeger’s to Amazon, helped design the cargo compartment specifications. It also worked with Draeger’s to develop the store’s grocery ordering app. For each delivery run, the customers’ orders are locked into separate compartments. They are unlocked with a customer-initiated signal from the smartphone linked to that order. The lightweight, 2,300-pound truck is built on a Polaris “GEM” neighborhood electric vehicle platform but uses a 20-kilowatt-hour lithium battery from Udelv. The Polaris battery it replaces is much smaller. The new battery gives the van a 60-mile range on each charge, Laury said. The van is limited under California law to a 25-mph top speed. It cannot operate on roads with speed limits greater than 35 mph, although it can cross them. Udelv was founded just two years ago by Laury and Ashkat Patel and now has a staff of about 30, mainly engineers. It was preceded by a “stealth” development company named Car One, Laury said. Its California autonomous testing permit initially was issued under that name. Laury is a Silicon Valley entrepreneur and venture capitalist. Patel is an autonomous vehicles engineer with a past stint at Tesla, where he managed the Autopilot driver assistance program. He also was a special projects hardware engineering manager at Apple. The two see Udelv as a three-pronged operation. Initially it will rent autonomous delivery vehicles as “a for-fee service for people who cannot afford to buy them” and lease to larger fleet operators who prefer not to purchase, Laury said. Ultimately, Udelv envisions its main business as supplying vehicles and software to large delivery companies such as UPS and FedEx. Together with the U.S. Postal Service, they now dominate the last-mile delivery market. “Our goal is to have 1,500 vehicles on the road by 2021,” Laury said. While Laury claims Tuesday’s delivery demonstration was the first of its type, it certainly wasn’t the first goods delivery in a self-driving truck, although other tests of autonomous trucks typically have involved larger, heavier vehicles making longer runs. Otto, Uber’s autonomy division, was the first to make a commercial delivery in the U.S., carting a shipment of Budweiser on a 120-mile beer run on Interstate 25 in Colorado in October, 2016. Embark Technology, a Southern California startup, tested an on-highway self-driving system just two months ago with a 650-mile delivery of refrigerators from El Paso, Texas, to Ontario, Calif., on busy Interstate 10. The Embark system was categorized as a Class 2 system – capable of automated following, lane keeping and in some circumstances acceleration and braking. That’s the highest level of “self-driving” permitted for heavy trucks under present California law. In any event, the Embark-equipped truck needed a human driver for maneuvering on local streets and in warehouse facilities. 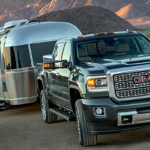 Autonomous vehicle testing laws in most states that permit on-highway testing also require the presence of a safety driver when the truck is running in self-driving mode. Automation, while threatening to some who fear being put out of work, is seen by many as a boon to the trucking industry, which operates on thin margins. Autonomous trucks “offer substantial growth, cost-cutting and consolidation opportunities to the fleet operators that can apply the optimal technologies,” Morgan Stanley analyst Adam Jonas wrote in a recent report to investors. The trucking industry – from local delivery to Class 8 long haul – also is facing a driver shortage as the industry fails to attract new young drivers to replace those who are retiring at an accelerating pace. Autonomous trucks could help alleviate the shortage, industry analysts say. In the last-mile delivery segment, Udelv “definitely marks a start,” said Cathy Roberson, analyst with Logistics Trends and Insights. “They are going to have to do a lot of marketing and answer a lot of questions, but with technology-obsessed Silicon Valley they picked the perfect place to launch, and they will learn a lot from this,” she said. “We will kick start a revolution” in the last-mile delivery business, Laury said.